Capture by the space station’s robotic Canadarm2 took place at 6:23 a.m. CDT (11:23 GMT) April 10 about 250 miles (402 kilometers) above the Pacific Ocean just west of Hawaii. Controlling the arm was Expedition 47 Flight Engineer and European Space Agency (ESA) astronaut Tim Peake. He, along with NASA astronaut Jeff Williams, monitored the approaching vessel from the Cupola window. Then, over the next two hours, ground teams controlled the arm to move Dragon from its capture point just 33 feet (10 meters) below the station to the Earth-facing port of the Harmony module. The command to automatically drive four bolts in the Common Berthing Mechanism connecting Dragon and Harmony was given at about 8:55 a.m. CDT (13:55 GMT). The stations computer rejected the command at first, but upon trying a second time, it accepted and the spacecraft was officially berthed to the ISS at 8:57 a.m. CDT (13:57 GMT)—some 40 feet (12 meters) from the OA-6 Cygnus cargo ship attached to the Unity module. This marks the first time two commercial vehicles were at the station at the same time. 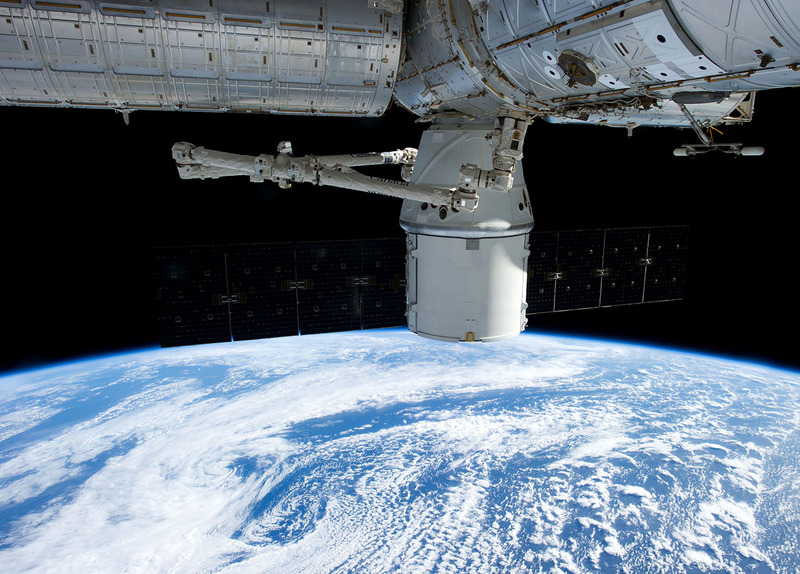 Dragon arrived just outside the station’s “Keep-out Sphere”—an area of about 656 feet (200 meters) around ISS—about 30 minutes later than originally planned. This was due to greater than expected atmospheric drag on the spacecraft’s solar panels resulting in correction burns by the vehicle’s Draco thrusters. The cargo ship reached the 820-foot (250-meter) hold point at about 5 a.m. CDT (10:00 GMT). This allowed for verification that the spacecraft had established a two-way UHF communications link with the space station. Flight controllers reduced the amount of time at this hold point, and a little over five minutes later, the spacecraft resumed its careful approach to the orbiting outpost. About 30 minutes later, Dragon was 98 feet (30 meters) from ISS. Ground teams in Houston and SpaceX headquarters in Hawthorne, California, were polled to verify everything was still “GO” for final approach and capture. Additionally, Williams could evaluate the ship to verify it was in the correction position and issue a hold, abort, or retreat in the event of a problem. However, everything was nominal and the approach continued until Dragon was just 33 feet (10 meters) below the Destiny lab. At 6:22 a.m. CDT (11:22 GMT) Peake manually controlled the arm to the grapple fixture on Dragon. A minute later, contact was made. The arrival of Dragon marked only the second time in the history of the space station program that six vehicles were docked or berthed to the outpost. The last time was in 2011 when Space Shuttle Discovery was docked with the complex on mission STS-133—that orbiter’s final flight. That was also the only time all of the originally planned government-owned vehicles (Space Shuttle, Soyuz, Progress, Japanese HTV, and the European Space Agency’s ATV) were at the station at the same time. 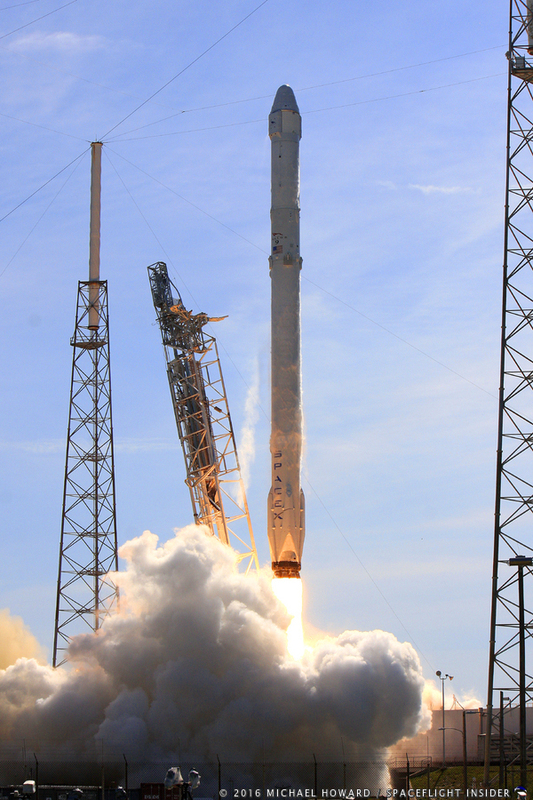 This is the eighth Dragon to visit the space station—the first since the ill-fated CRS-7 mission. It is also the 84th uncrewed cargo ship and 170th overall mission to reach the orbiting laboratory. On April 16, CRS-8’s most notable cargo, the Bigelow Expandable Activity Module (BEAM) will be robotically removed from the unpressurized trunk of the spacecraft and attached to the aft port of the Tranquility module. It will be expanded sometime in late May.